Data science and the impact it will have on business and society has never been more hyped. Yet the reality is very few organizations today are getting business value from their data science (or AI) investments. A recent study shows that while 85% believe AI will allow their companies to obtain or sustain a competitive advantage, only 5% are using AI extensively. The reason for this gap is because it’s extremely hard for companies to get models (the core of many AI solutions) beyond their data science teams and into production. 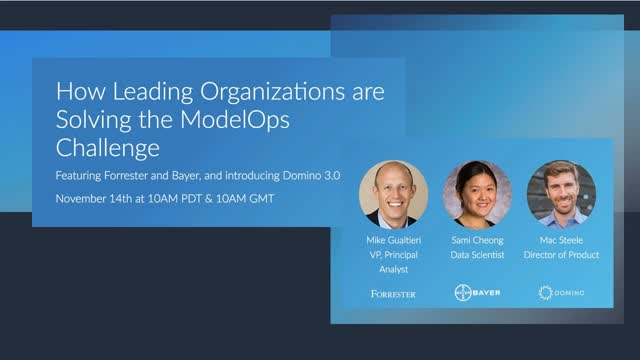 There will be a short demonstration of Domino’s data science platform in addition to practical tips from an industry expert and leading practitioner. Scaling is hard. Scaling data science is extra hard. What does it take to run a sophisticated data science organization? What are some of the things that need to be on your mind as you scale to a repeatable, high-throughput data science machine? Erik Andrejko, VP of Science at The Climate Corporation, has spent a number of years focused on this problem, building and growing multi-disciplinary data science teams. In this video, we discuss what is critical to continue building world-class data science teams. We also discuss the practice of data science, the scaling of organizations, and key components and best practices of a data science project. Through working with companies ranging from agile startups to the Fortune 500, Domino has been able to curate use cases and learnings from these organizations about the challenges and successes of growing data science teams. Over the last several years, financial institutions have had to delicately balance managing demands from regulators and stakeholders. Increased governance and need for transparency around custom credit risk and finance analytics have prompted institutions to focus investments in such areas. Learn how Moody’s Analytic’s centralized, cloud-based data science platform is empowering new, customized client solutions that are pushing the envelope in the financial services market. -Why Moody’s Analytics chose a central, cloud-based data science platform. -How to bring a software engineering discipline to data science without constraining innovation. -How data scientists at Moody’s Analytics are aligning with business goals and improving competitive differentiation. -Why data-driven companies should be worried about data scientists’ Shadow IT. Today, the best-run companies run their business on models, and those that don’t face existential threat. Welcome to "The Model Driven Business" - a channel where we will share use cases and best practices for organizations striving to make data science an organizational capability that drives business impact.